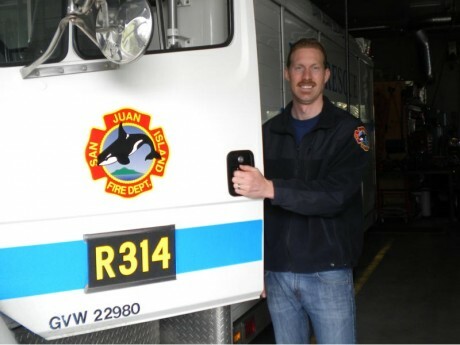 Ian is one of our newest firefighters on the San Juan Island Fire & Rescue team. He was born in Zambia, Africa of missionary parents but moved back to Tennessee when he was four years old. He has also lived in New Hampshire and in Colorado where he received a Bachelor of Arts degree in Youth Ministry with a minor in Sound Recording from Colorado Christian University. He met his wife, Jessica, at the University and moved back here in 2009 after graduation. Jessica is actually from San Juan Island! Ian is working for her father, Dave Hall, owner of Island Glass. Ian and Jessica have four daughters ranging from 7 years to 8 months all of whom are, or will be, home schooled by their mom (Ian teaches them Math). Ian has friends who are already in the Fire Department and had been debating on joining for a while but finding the time was the issue. He finally decided that he would try to balance another thing on his plate and it has worked out well for him and his family. When he is available, he jumps up and answers the call, when he is not, he doesn’t feel badly that he can’t go. He does his best to balance everything. “People are busy and have time commitments. Don’t worry about it. It is not as big a deal as you think. Try it out. The training in general is just great stuff to know. It will serve you the rest of your life. If you really enjoy it, like I do, you’ll make time for it”, Ian says. He is already taking classes for upgrading to a Firefighter 2 classification and will be attending classes at the Fire Training Academy in North Bend, Washington in a few weeks. San Juan Island Fire & Rescue welcomes all interested men and women ages 16 years and above to drop by the Mullis Street Station and make an appointment to learn what we are all about. We offer some fun ancillary positions as well. Look online at www.sjifire.org for lots of good information. Or view our Facebook page. Our phone number is (360) 378-5334. We would be pleased to talk with you.